Heuwelsig Cottages & Auto Home camping plots - Franschhoek Accommodation. Heuwelsig is situated on a working wine farm, surrounded by lush vineyard, orchards and scenic landscapes, just 5 km from the well-known village of Franschhoek, about an hours drive from Cape Town. Franchhoek originated for the French Hugenote, who settle here in the 17th century, bringing with them the culture and charm from Europe. Today Franschhoek, which means "French Corner", is a vibrant town offering wine tasting, five star cuisine, an abundance of different artists, small boutiques, all surrounded by majestic mountains and beautiful scenery. The cottages, offers a tranquil retreat from the hustle and bustle of city life, for couples and families, visiting this scenic part of the Cape Winelands. Heuwelsig cottages comprises of two luxurious self-catering units/ cottages, each with en-suite bathrooms, individually decorated with the finest white linen, fluffy white towels, under floor heating, satellite TV, private entrance with splendid views overlooking the Franschhoek valley and mountains. We have added 3 auto home camping plots, a new addition for 2018, on the farm for auto homes (motorhomes), vising the Franschhoek valley. A log fireplace in each cottages, provides cozy snuggle up for the cold winter months and there are portable barbeque facilities on the premises for the guests to use outside. Expect a hearty welcome from the staff at Heuwelsig Cottages, which provides a feeling of a secure, modern and relaxing atmosphere. Heuwelsig Cottages, do not have a 24 hour reception service. Reception office closes at 16:00 pm Monday to Friday. Please inform the manager on duty if you will be arriving after 16:00 on your day of arrival to ensure that you receive assistance with checking yourself in, with all the necessary information required. We specialize in rental to the discerning clientele on a monthly basis. The Family Cottage provides accommodation for a family of four and offers panoramic views of the valley and vineyard and private courtyard in the back. The Family Cottage provides a feeling of a secure, comfortable and spacious atmosphere, offering a lounge with fire place, kitchen/ dining area, equipped with all glass ware, crockery, cutlery and electrical equipment. Portable braai facilities available outside, private entrance and save parking on the premises. 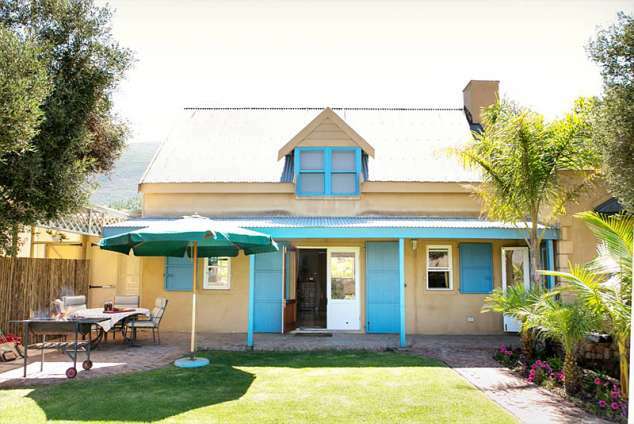 The Mountain Cottage provides accommodation for two adults only and offers a spectacular view of the mountains and peach orchards and private courtyard in the back. The Mountain Cottage provides a feeling of a secure, comfortable and cozy environment, offering a lounge with built-in barbeque/ fireplace, kitchen equipped with all glassware, crockery, cutlery and electrical equipment. Portable barbeque facilities outside, private entrance and save parking on the premises. We only take auto homes (motorhomes), being completely equipped with everything needed. From the airport, take the N2 South towards Somerset West. After about 2km, take the first exit: the R300 to Bellville and Durbanville. The R300 will take you through to the N1 turn-off. Take the turn-off to the N1 going towards Paarl. From Cape Town, take the N1 highway towards Paarl. Continue on the N1 until you reach the R44 Stellenbosch / (R101) Klapmuts / Wellington turn-off (Exit 47, about 19.5km after the R300 turn-off). Take this turn-off and turn right at the stop sign at the bottom of the turn-off. Go under the bridge and cross over the traffic lights indicating (R101). Continue on this road for about 500 metres where you will see the (R45) turn-off to Franschhoek to your left. Take this road and travel for approximately 9km until you reach the T-junction (you will see Vrede en Lust on your right and cross over an old rail track right before you reach the T-junction). At the T-junction turn right towards Franschhoek R45. Continue on this road. You will pass Simondium Country Lodge on your left and the R310 to Stellenbosch, on your right. Cross the Dwars River bridge, pass the Groot Drakenstein Games Club on your left and L’Omarins on your right. Continue past Bridge House on your right and The Riverside on your left. You will then cross the Berg River bridge. Approximately 1km further you will pass the R301 on your left and the Berg River Dam on your right. From here you continue and La Motte Estate will be on your left. Just past the Estate you will see a green road sign reading 'La Motte Station Road' here you turn left onto the gravel road. Please note, there is no board, so please look out for Leopards Leap at the bottom of the road. Travel along this gravel road for approximately 800m, until you come to an iron gate. Heuwelsig Farm. Please let me know your estimated time of arrival and phone me to open the gate on your arrival. Follow the signs to the cottages, by turning right immediately and then first left. Enjoy your trip and drive safely. 12713 page views since 20 Jul, 2011.